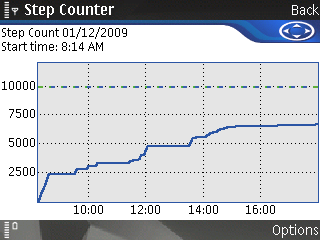 One of my favourite applications for my Nokia N95 mobile phone is Step Counter: it uses the accelerometer in the phone to detect every step I take and then displays information about when and how many steps I take each day. I started the day walking Oliver to school (it was cold yesterday, hence our “intense” walking), then walked to Casa Mia where I stayed motionless until 9:30 a.m. I then walked back to the office, worked a tiny bit, walked to the bus for 10:00 a.m. and then walked to my class at UPEI. Class was over at 11:20 and I walked to the cafeteria, had a walking lunch, then took the bus down to the Royal Bank stop where I got off and did some more outdoor intense-style walking down to the Credit Union, and then back to the office. I was sedentary until about 1:30 when I walked home, drove Catherine to the airport, did some errands, then picked up Oliver. 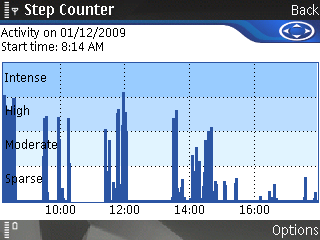 We got home about 3:00 p.m. and, as you can see, I didn’t do a lot of walking around after that. Even though I took the car to pick up Oliver, it was a fairly typical day for me. Even after just a day of tracking things, it’s obvious (and of course should have been obvious to me even without gizmotic assistance) that I’ve got some nighttime motionlessness issues, mostly television-watching related. A nice after-supper walk and I wouldn’t have much trouble getting into Oprah territory. Written January 13, 2009 at 10:14 a.m.
My Mom and Dad do the after-supper walk quite a lot. They recommend it. Try to leave the immediate area, since it’ll get on your nerves.